One of Wall Street's most misbegotten memes is the Goldilocks Economy notion. They invariably trot her out near the end of a business cycle in order to keep the mullets buying stocks and the Fed heads as anesthetized as possible. The theory, of course, is that with the economy in a perfect and endless growth equilibrium, punters should be eager to buy equities and the central bank should be in no rush to remove the punch bowl. "These figures should satisfy Fed policymakers that inflation is not too cold, as last spring's numbers hinted at, or too hot, as might have been inferred from the January print," said Michael Feroli, an economist at JPMorgan in New York. That statement is risible nonsense. To the contrary, the great David Rosenberg, an honest economist who finally fled the Wall Street sell-side for Toronto, where he runs an honest-to-goodness subscription service, noted that core inflation is accelerating rapidly. To wit, on a year-over-year basis the CPI less food and energy printed at "only" 1.8%, but that embodies a huge base effect owing to the aberrational plunge in telecom services last March. By contrast, on a three month rolling basis, the core CPI has risen from 1.9% in November, to 2.3% in December, 2.9% in January and 3.1% in February! In fact, the 3.1% three-month annualized rate in February was the highest it's been since before the Lehman induced melt-down in September 2008. Moreover, we are talking about "core" CPI here with no wild oil price fluctuations confusing the picture. And that also means that when the huge telecom adjustment drops out of the CPI less food and energy base next month, the Y/Y figure will also sharply accelerate. Then came along this AM's punk retail sales number for the third month in a row. Indeed, it seems that the December-February monthly average of $492.4 billion is actually nearly a billion below the level reported back in November. Then again, why should anyone be surprised? It is well known that US consumers apparently did shop until they dropped during their on-line Christmas buying mania, and they did so by massively tapping their credit cards: The monthly rate of borrowing gains actually nearly doubled in the final quarter last year. Now, apparently, consumers are attempting to pay back some of that debt, including using their February tax refunds and fattened after-tax paychecks for that purpose. Never mind, of course, that the debt they apparently have paid down was, on the margin, borrowed by Uncle Sam to make it all possible. But we get ahead of ourselves. The Federal borrowing spree cranking up for FY 2019 is exactly what is going to put to heavenly sleep what remains of Goldilocks at present (see Part 2 on Thursday). Needless to say, three months of slipping retail sales hardly heralds a booming Q1 print for personal consumption expenditures (retail sales are 60% of the total) and real GDP, but the talking heads had an answer for that, too. To wit, late tax refunds! Now think about that one. The withholding tables were adjusted to reflect the ballyhooed Trump tax cut as of early February, which for individual taxpayers peaks in the first year at an $190 billion annual rate of reduction. But never mind, the refunds slipped. Well, actually they didn't. Last February (2017), tax refunds totaled $113 billion and this February the figure was nearly $129 billion. Likewise, the February PPI for final sales of goods printed at 2.8% year/year, but predictably the stock cheerleaders at MarketWatch headlined "inflation tamer in February" because, well, the print was a tad lower than January's 3.1% Y/Y. In fact, the financial press is so lost in the decimal point weeds that MarketWatch included this helpful chart to support its "tamer" inflation headline. When we say that the Wall Street narrative has been totally corrupted by the Fed's endless monetary juice and price keeping operations, that's exactly what we mean. No one from the real world would ever espy anything "tamer" in the above. So we have faltering retail sales and resurgent inflation, yet again this morning we heard on bubblevision one of the usual suspects, Joe Lavorgna of Nataxis, insisting that there is "no inflation" and no recession in sight, and that accordingly 2018 will be a bang-up year for stocks. That is, according to Lavorgna, if the Fed doesn't do anything rash and deprive the carry trade gamblers of negative real money market interest rates too soon. After all, short term rates used to finance speculation in carry trades and the options market have been negative in real terms since the fall of 2008. Why not another year of free money? The truth of the matter, of course, is that there is so much noise in the incoming monthly deltas that neither Lavorgna and his group-think Wall Street colleagues nor their Keynesian clones at the Fed have any clue about where the near-term economy is heading, or even where it is right at this moment. That was evident by the scramble to downgrade Q1 GDP forecasts after today's retail sales report. What was supposed to be a blow-out quarter owing to the Trump tax cut is now being hurriedly ratcheted back to the same old 2% (or less) slog. As far as paint-by-the-numbers GDP forecasting goes, in fact, the technical folks at the Atlanta Fed are about as good as anyone else. They have some very complex, time-tested equations which allow them to plug into algorithms the key monthly numbers as they come in a highly mechanical, non-discretionary manner. So here's the rather dramatic skunk in the woodpile. In just 50 days, their "plug and play" model forecast for Q1 real GDP has dropped from a booming 5.4% to a rapidly deflating 1.9% rate. That's about the same thing as saying, "folks, we don't have a clue!". It's also a way of saying that Keynesian monetary central planning is an epic scam. Its essential modus operandi is based on short-term macroeconomic forecasting, but even the Fed's most sophisticated, data-driven mechanical model is coming up with noise. So the 12 members of the FOMC can't possibly deftly tweak the dials on their crude instruments of money market interest rates and balance sheet expansion/contraction so as to guide the short-term path of the economy. Not only do they not know where they are at turning points like the present, but their instruments of control are far too frail to steer a $20 trillion capitalist economy, anyway. And most especially, not one that is integrally embedded in an $80 trillion global economy subject to massive state intervention, including by their own all-powerful central banks. As it happened, today's discordant data and recent Goldilocks happy talk got us thinking about what happened last time around. That is, in the summer and fall of 2007 when Wall Street was rife with it, and the S&P 500 kept plowing higher, peaking at 1570 in October. In a word, there was allegedly no sign of accelerating inflation, decelerating economic growth or a hint that the worst of both worlds---stagflation---was just around the corner. It was, and to the very month. In November 2007, year/year retail sales growth peaked at 5.3%, but it was under 2.0% by April, hit the flat-line in September, and then plunged to negative 12% on a year-over year basis in December 2008. At the same time, the PPI less food and energy went the other way. From a 2.2% Y/Y rate in November 2007, it accelerated to 3.0% by May and then north of 4.0% by the fall of 2008. And that excludes energy and the direct impact of the massive oil shock at $150 per barrel in July 2008. At the end of the day, you can't find a worse chart for the stock market than that for the 14 months below. Yet enthrall to the alleged Goldilocks Economy, no one on Wall Street saw it coming. The consensus operating earnings forecast for 2008, in fact, was north of $110 per share on the S&P 500. As it happened, operating earnings for the year ahead actually came out at $49 per share. A Goldilocks moment it most definitely wasn't. In Part 2, we will document why the kind of unexpected macro-shock embodied in the above chart is about ready to happen again. And the spoiler alert is this: The crashing Wall Street bubble in the fall of 2008 is what took the main street economy down. And like now, it was visible for all to see if you were monitoring the casino, not the monthly deltas from the Washington statistical mills. 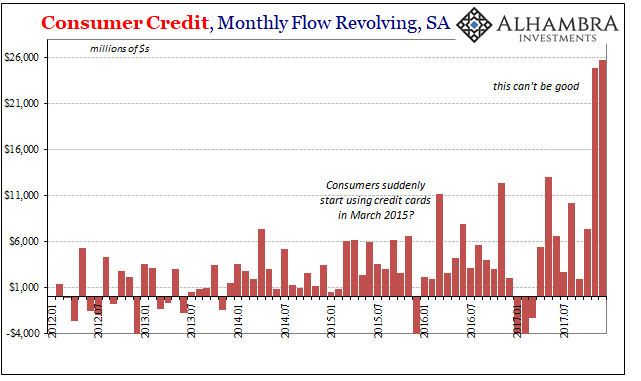 Moreover, like then, the American consumer has again borrowed to the hilt because they can and because Wall Street and the Fed have sounded the "all clear". That will soon prove to be the same huge mistake is was last time around.